As a leader in the recurring revenue world, your job is always getting harder. Competition is increasing. Your customers are expecting more from you. The relative value of your features is declining. 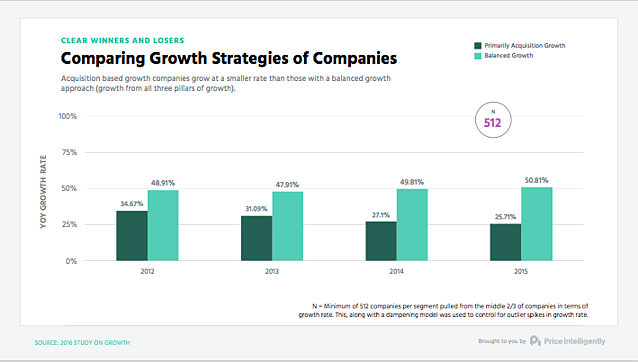 The strategies you’ve used to grow your company for the last five years aren’t going to work for the next five years. 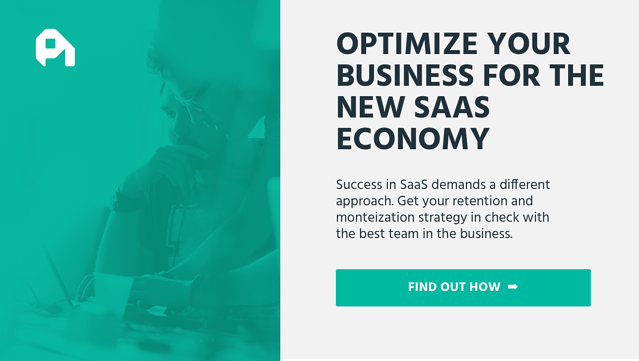 You can either adapt to the new SaaS economy, or fall behind. 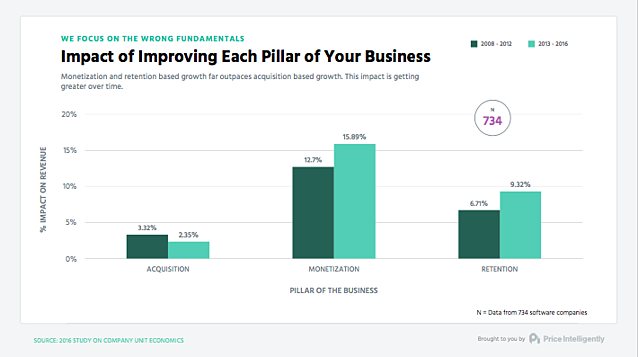 At this year’s SaaStock conference in Dublin, Ireland, I shared some of our insights into the state of the subscription economy, informed by our visibility into roughly one in four SaaS companies on the market. We found that you're going to need an entirely new approach to everything from your monetization strategy to your customer development efforts. Let's first take a look at how the SaaS economy has evolved over the last five years before diving into the implications for your business. 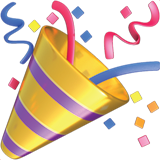 Ten years ago, there were 500 marketing software products designed for marketers. Today, there over 8,500. There’s a clear reason for this proliferation: it’s ten times faster to build a software company today than at any time in the past. With the rise of easily deployable infrastructure like AWS and readymade website builders, it’s possible to get a company up and running in less than a day and start collecting leads. We see this in the data we’ve collected about SaaS competition. 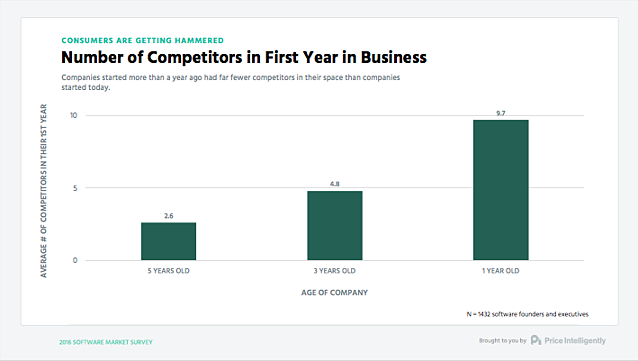 When we surveyed SaaS founders, we found that the companies that started five years ago faced an average of 2.6 competitors in their first year of business. Those founded a year ago were up against 9.7. This level of competition has raised the bar for the quality of our products and increased the feature set expected by our customers. 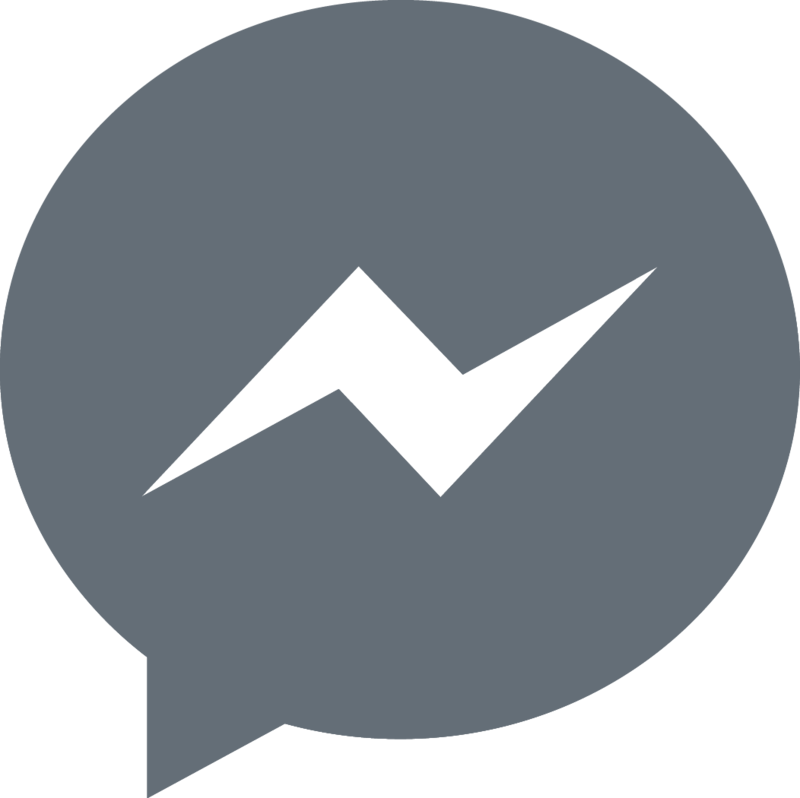 Features like integrations, once able to generate thousands of dollars in revenue, are now considered bare minimum functionality. 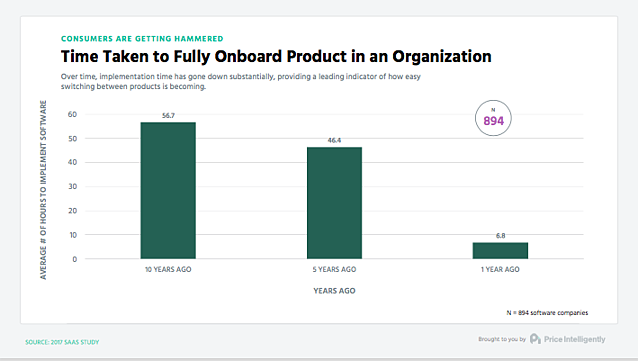 The benefits of all this competition and technological advancement to our consumers extend beyond features: the average amount of time it takes to fully implement a new software product has plummeted from 57 hours ten years ago to 7 hours today. While our customers are able to get up and running with new products at record speed, we’re not able to acquire them at the same clip. The rise in competition in the SaaS market has decreased switching costs and increased our average CAC, despite the fact that we can take advantage of more sales and marketing channels than at any time before. Not only is it getting more difficult (and expensive) to acquire users, but those we do manage to get on our products aren’t as happy as they used to be. 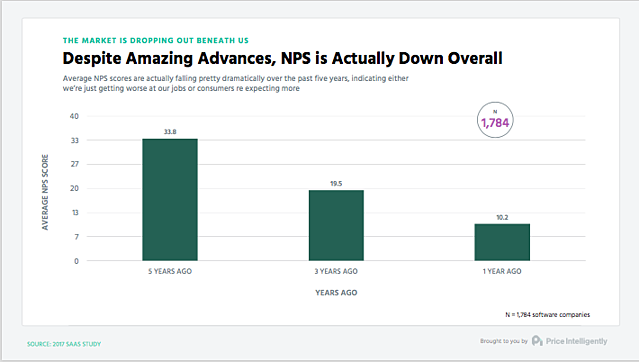 Average NPS scores are ⅓ of what they were five years ago. These sea changes in our industry all point to a simple conclusion: what once worked is no longer working. If we’re going to get back on track, we have to change our priorities. We’ve been preaching the importance of monetization for years now. Yet, most companies still aren’t devoting sufficient time to creating a strong pricing strategy, let alone continually optimizing their pricing. The impact of our collective lack of attention to pricing is compounded by decisions made by our sales teams. Many of our best salespeople have gotten a little too trigger happy with discounting to close deals. 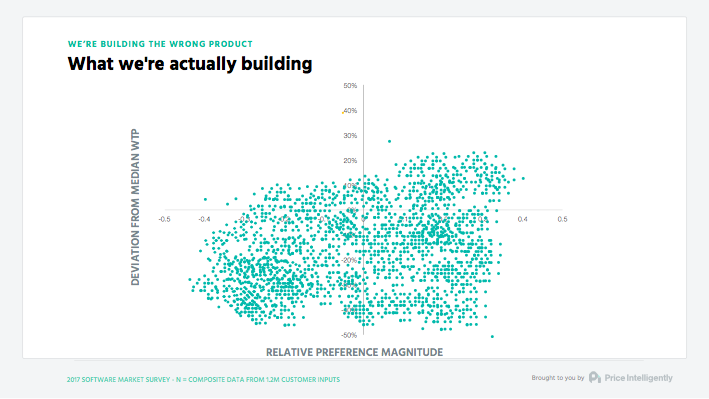 In our analysis of over 50k software companies, we found that discounts over 30% absolutely decimate your customer’s future willingness to pay for your product and their perception of your brand. When taken together, our research on competition, customer satisfaction, and monetization points to a new reality in which customer acquisition efforts are the table stakes in an increasingly complex game. With saturated marketing channels and increasing CAC, investments in acquisition are less effective today than they used to be. In order to compete today, you’ll have to devote significantly more time and resources to your monetization and retention efforts. Let’s talk about how you can actually make that happen. In order to improve the areas of your business with the biggest financial impact, you have to start with a deeper understanding of your customers. We’re all fond of saying that our customers come first, but few of us actively put our money (or our time) where our mouth is. 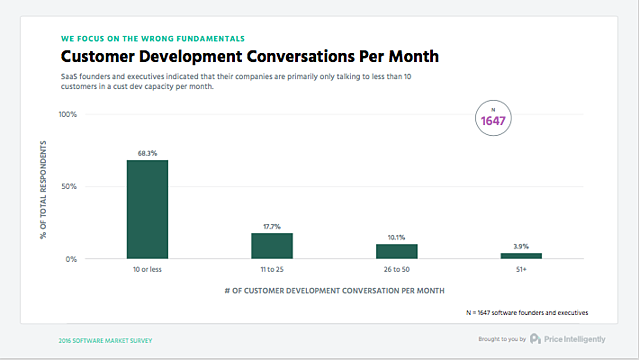 Most SaaS founders report having fewer than ten customer development conversations each month. With all the time spent not talking to our customers, you’d think we’d be constantly testing new approaches to our sales, marketing, and products. 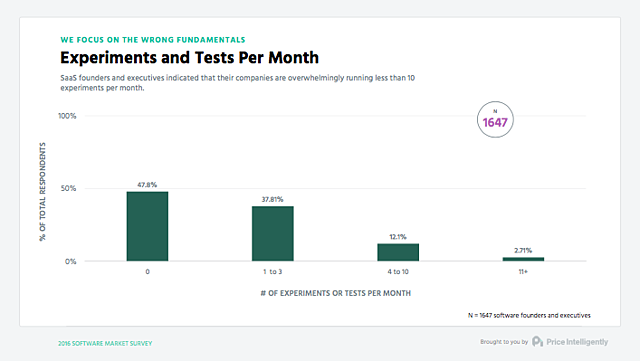 Unfortunately, nearly half of us aren’t running a single experiment per month. What happens when we abandon our customers and stop trying new things? 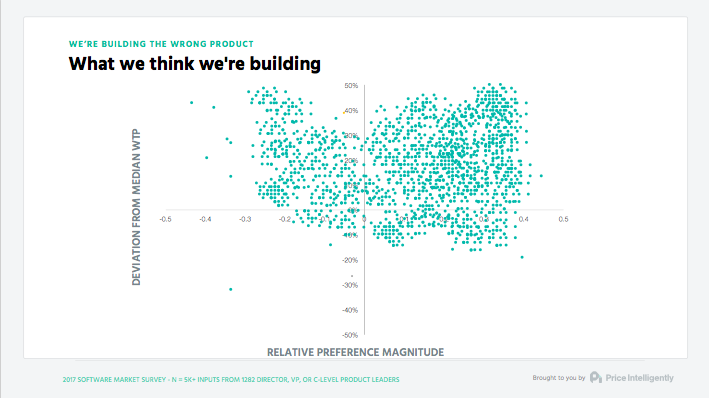 Overwhelmingly, we end up building the wrong products. 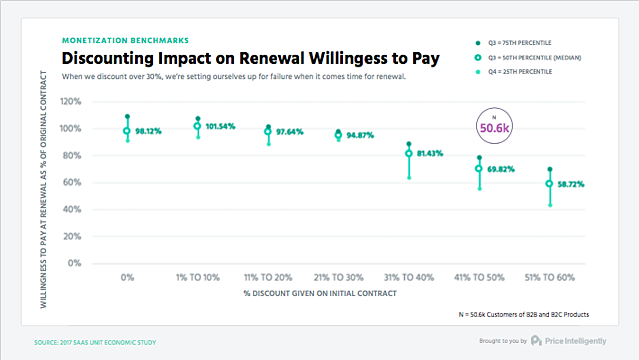 Over the last few years, we’ve gone out and surveyed about 1.2 million SaaS customers about the features they value and how much they’re willing to pay for each. We found that features fell into one of four quadrants you can see below. Not bad, eh? Our product teams are painting a pretty rosy state of affairs in SaaS, one in which they're perfectly attuned to the needs of their wholly satisfied customers. There’s just one problem: it isn’t true. It turns out that we all spend way more time in trash land than we thought. There's a simple and easily addressible reason for it: we've lost touch with our customers. A few years ago, we could get away without doing much customer research. In the nascent SaaS market, most new products seemed leagues ahead of the unwieldy platforms that came before. Our customers didn’t have many alternatives, anyway. The story is markedly different today. The companies that aren’t doing the work to know their customers are falling behind. 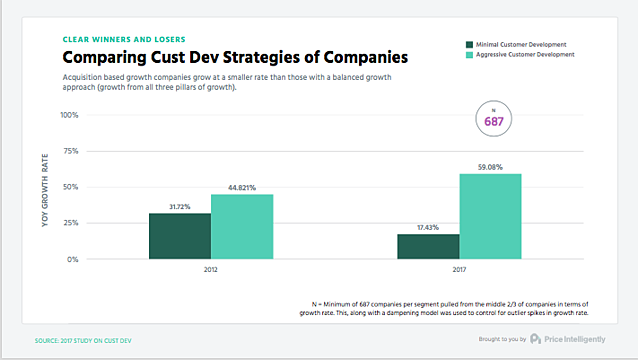 The growth gap between companies actively engaged in customer development and those who aren’t keeps widening. The data on our growth strategies tells the same story. Those of us exclusively focused on acquisition are growing at a far slower pace than those with a balanced approach. This should be terrifying to most subscription companies out there. Every part of your business is designed to drive as many potential buyers as possible through your funnel to a sale. If we don’t know who our potential buyers are or what they want, it doesn’t matter how many marketing gimmicks or special offers we throw at them. When they get to the point of making a purchase decision, they’re going to go with the product that delivers the most value. It's time to change our focus. 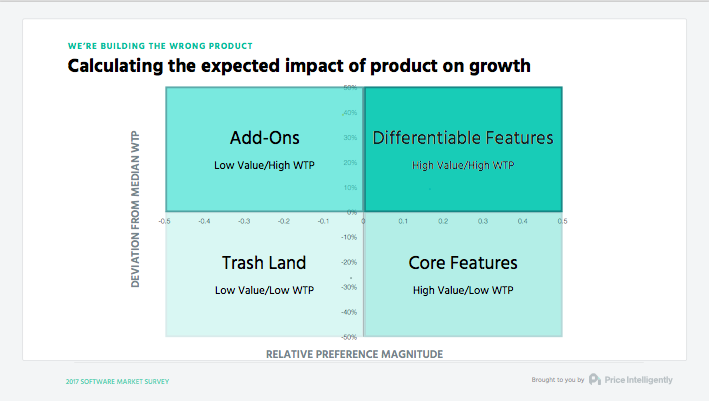 Let's drop our obsession with adding more and more bad customers and start building better products that are positioned perfectly for our best customers. That's the only way to win in the new SaaS economy. The companies that will win the next five years are laser focused on the fundamentals. They’re optimizing their unit economics. They’re talking to their customers, understanding their wants, and building the features that make them open their wallets. They’re realizing that those who are still playing by the old set of rules are going to lose in the new SaaS economy. It's up to you to make sure you're one of the winners.